Commercial beer, commercial music, numbers commercial, and the commerce of parties. Their standard 500ml bottle, 7% ABV, so around 210 calories a serve size (290 the bottle) , and 2.8 standard drink units to enjoy. Brewed by Emerson’s Brewing Company (Lion Breweries – NZ (Lion Nathan Co.) in the style this is India Pale Ale (IPA), and they do this is Dunedin. Bird Dog uses only one hop variety, NZ Cascade, from the boil right through to its massive dry hopping. Single hopped beers really give an appreciation for the characters of that particular hop and The Brew Crew here at Emerson’s reckon Bird Dog showcases NZ Cascade beautifully. A copper coloured pale ale with huge amounts of NZ Cascade that has created a floral, spicy aromatic pale ale that smells as delicious as it tastes. The hop flavour is high with a firm bitterness that leaves a crisp finish. 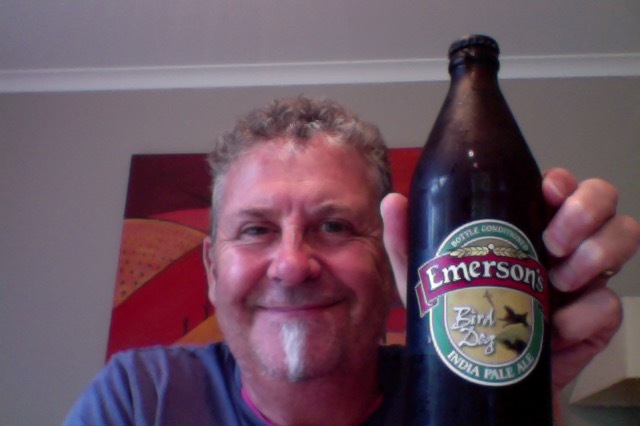 If you aren’t a ‘Hophead’ already this is the Emerson beer that might convert you!. The combination of NZ and US hops in the boil, the hopback, and dry hopping, along with traditional bottle conditioning makes this true India Pale Ale a significant addition to our range. Bird Dog has always been a tribute to The Verlaines album by the same name, and John Collie’s painting which appeared on the Bird Dog album features on the Bird Dog label. The stand out feature of Bird Dog IPA is that it will be cellared for some weeks prior to each batch’s release and sold only when the flavours have developed to our satisfaction. Why? Because after many trials we discovered the beer hit its peak well after bottling date, and keeps improving. Why would any brewer not want to share that? and what cold possibly go wrong? Emerson’s are of course a known craft brewer who were brought but a big beer commercial, who’ve somehow managed not to mess it up. This is a beer that’s a distinct citrus note on the aroma on opening. It looks like it pours a light golden but it is an orange golden when it’s finished, and with a large head of light white fluff and foam. Aroma remains that of a citrus predominant thing, oranges? It drinks like it is very fresh and ‘green’, the bitterness is present throughout the length and the finish is sweeter than dry. There is a nice lingering mouthfeel too. I got to the second pour in quick time, either thirsty, possibly, or this is a welcoming and refreshing beer, or I’ve a drinking problem. I wish I’d got a couple of these it really is a pleasant and thoroughly enjoyable IPA, where the range of things comes to play and you’re not battling a hop-heavy arid dry crusher. An everyday IPA perhaps, not a session IPA at 7% but I’d be happy if I could afford this is a go-to beer in the fridge. The pdubyah-o-meter rates this as a 9 of its things from the thing. I like this a lot as a drinking beer, but peaks at good drinking and isn’t spectacular, the favours and profile are great and the whole is a bit nice and polite. It’s close to a top mark beer but might, or me, have to have more bitterness, a sharper finish and for the flavours to be dialled up a bit. Other than that it’s a blinding good beer to drink. Get in! Am I enjoying it? Yes I am. Would I have another? Yes I would if I could. Would I share with a friend on a porch and set the world to rights? This would be both a good introduction to IPA beers and a go-to beer, it really is good. Musics, of course, the less than world-wide popular and famous – “The Verlaines” and the Album “The Verlaines” which you can find on the Spotify, the iTunes and probably other places. The Verlaines are a rock band from Dunedin, New Zealand. Formed in 1981. 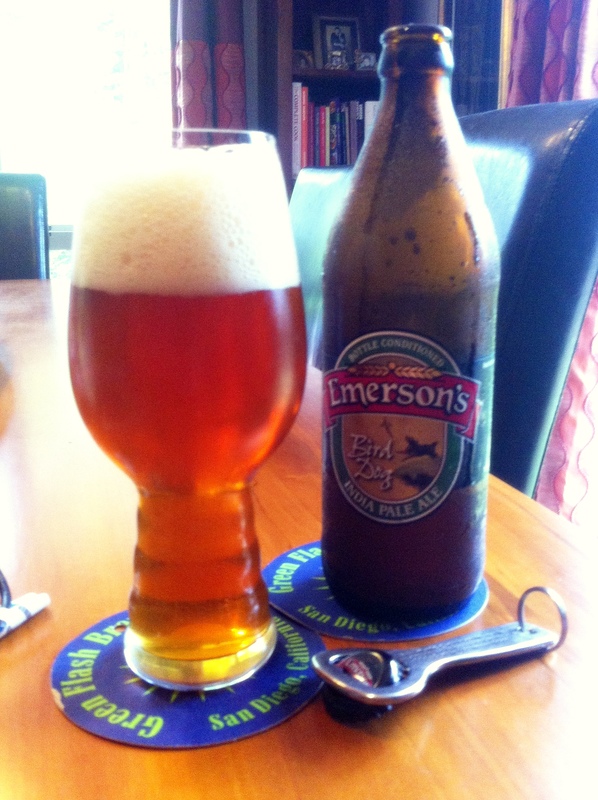 This entry was posted on February 14, 2015 by Philip Walter in Beer, Beer of New Zealand, Beer Review, Craft Beer, Critic, Emerson's, India Pale Ale (IPA) and tagged Bird Dog IPA, craft beer, Emerson's Bird Dog, Emerson’s Brewery.